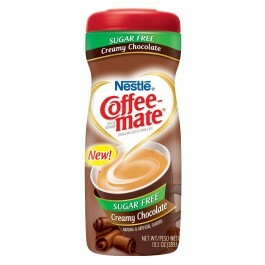 Maak een perfect kopje koffie door deze Coffee Mate Creamy Chocolate toe te voegen. De smaakvolle melkpoeder van Nestlé met een rijke chocolade smaak (suikervrij) zal uw trek in zoetigheid op elk moment van de dag stillen. Non-dairy, Sugar free, Lactose free, Cholesterol free, Gluten free, Kosher Ingredients: Vegetable Oil (Partially Hydrogenated Coconut Or Palm Kernel, Hydrogenated Soybean), Corn Syrup Solids**, Natural And Artificial Flavors, Sodium Caseinate (A Milk Derivative)***, Cocoa Processed With Alkali, And Less Than 2% of Dipotassium Phosphate (Moderates Coffee Acidity), Salt, Mono- And Diglycerides (Prevents Oil Separation), Sodium Aluminosilicate, Sucralose, Acesulfame Potassium (Non-Nutritive Sweetener). Contains: Milk Derivative. **Adds A Trivial Amount of Sugar. ***Not A Source of Lactose.